Does 3.0 finally mean smooth playback over USB? DisplayLink makes the chip that powers USB video docks from companies like HP and Toshiba; today an adapter lets a PC or Mac drive up to six screens over USB, but the resolution hasn't been enough for a 30-inch screen. The USB 3 prototype DisplayLink showed us at CES will change that. The blue USB 3.0 cable runs from the prototype to a PC under the table that's playing the movie; the black cable runs to the HDMI port and this is the PC playing HD video out of the USB 3.0 port. Several PC manufacturers have USB 3.0 in new laptops at CES, including HP and Asus, and there are PCI and Express Card adapters to add USB 3.0 to existing PCs. DisplayLink is using USB 3.0 to deliver higher resolutions, at greater frame rates, on more and more screens. We saw a prototype of the next generation DisplayLink hardware, using USB 3.0. 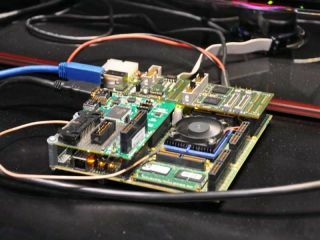 Currently a set of development boards hooked up to a desktop PC with a USB 3.0 PCI card, the prototype is already delivering impressive performance – sending 1080p video to a Samsung LCD TV at a little over 30 frames per second. This uses DisplayLink's new lossless compression algorithm designed for high speed playback. "At the same time we're transferring native HD video to the PC for decoding," said DisplayLink's Marketing and Business Development vice president Dennis Crespo, which means the system is delivering a huge amount of video information simultaneously. The video isn't blurred; we're dragging it around the screen and shaking the window around but the playback carries on without pausing, stuttering or breaking up at all. The new system will be able to drive much bigger screens – 30-inch and above – and there's support for Windows 7's transparency effects, even on screens bigger than that. That's only the prototype, and Crespo expects the actual frame rate will be closer to 60 in the final chip. It will take about six months to turn the current prototype into a chip ("It's probably the most complicated thing we've done technically," he told us) and docks with the new hardware should be on sale by the end of the year. Current DisplayLink-powered docks like the new one from HP come in at around £60; Crespo says the new chip will mean USB 3.0 docks will be cheaper and have more connections. He's expecting docks with multiple HDMI ports, as well as two VGA ports rather than one – and your PC will be able to drive all those screens at once.